Augustine of Hippo once said, “the world is a book and those who do not travel read only one page.” This quote rings through to my inner core. It shakes me, it inspires me and it ignites my passion for travel. Whether I am planning a trip to Punta Canta, a cruise of the Caribbean or a weekend staycation, I am always excited for adventure. Last weekend I was able to pull off an epic staycation for me and my husband. We came into Traverse City, stayed the night at the Sierra Motel and enjoyed the Microbrew & Music Festival. Put on by Porterhouse Productions, the Festival is something you need to experience for yourself. Being a Yooper, I am use to cold weather and snow so standing outside for 6-7 hours drinking beer sounded like a GREAT time to me. Michiganders know how to have a good time and Sam Porter, of Porterhouse Productions, knows how to rock the city so I knew I was in for a treat. The line to get into the Festival was enormous, but not surprising, given that 4000 were attending the event. The volunteers worked hard and it showed because that line moved a lot faster than I would have ever imagined. Once we got our wrist bands and beer tickets we made our way to another line to purchase a Microbrew pint glass. I am so glad we did because they are super cute and they made for larger pours! Within minutes of arriving, I met up with Deb of Just Short of Crazy and honestly, whenever I hang with her, we have a blast! There were many microbrews set up in their own tents lining the edges of the event and as soon as I saw Bells I was OFF because I love their Two Hearted Ale. Well, much to my chagrin, they never tapped it and I checked often. I did, however discover my new favorite Michigan beer, Petoskey Brewing Company's Hopsessed Double IPA, and that may not have happened if it hadn't been for the lack of the Two Hearted. Out of the ashes, the Phoenix appears and in this case, Hopsessed is the Phoenix!! It was a mere 30º for the Festival and it was cold. Thankfully, I had toe warmers in my boots to keep me warm. I also discovered, after being cold for a couple hours, that there were large, warm tents with MANY more brewskis and music inside! BONUS! 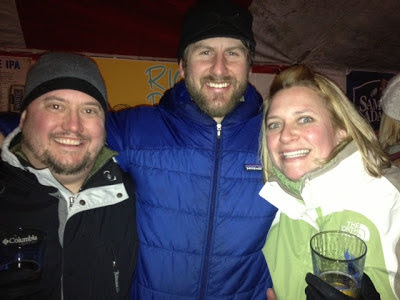 While in the tent with Petoskey Brewing Company, my husband and I ran into Sam Porter, the main man and the reason for the party! Later, he was jamming on his drums up onstage--epic! Hot food, hot ciders, cold beer and mead coupled with live music and friends, what more could you ask for in a small-town Festival with a big town feel! You definitely felt like you were in a BIG city because this festival was organized so well and it was rocking. I ran into several people I hadn't seen in awhile and it was so nice to connect with them again. Its funny how out-of-the-loop you can get after you have kids! Here we met up and hung out with Jason's brother Jeremy and his wife Jennie. One big Smith clan! Can you tell how happy we all were? 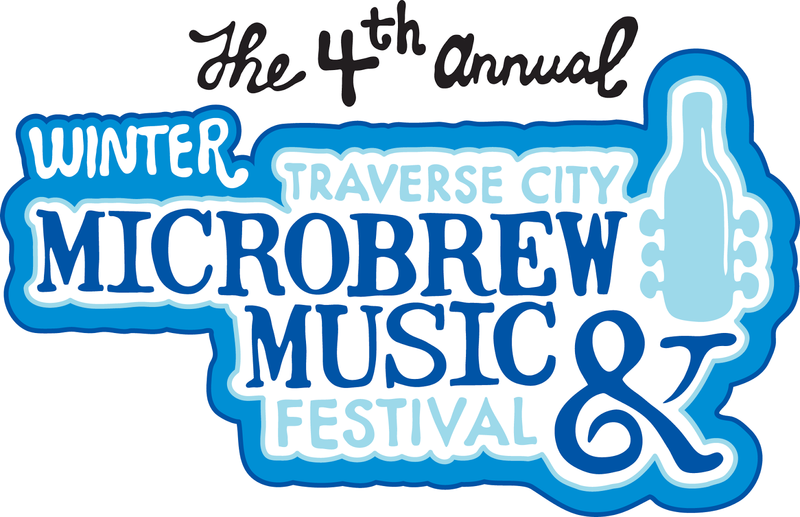 We are still talking about the Microbrew & Music Festival because it was the best time we had had in YEARS. That seemed to be the consensus of many people that we talked to at the Festival. Once night was upon us and the warmth of the sun was gone, we decided to get a bite of food. Jason and I shared two tacos from a local food truck and they were delicious. Jennie wanted everyone to act silly in the Silent Disco Tent so we were off. Once inside, we were given headphones so we could dance dance dance. It was a blast watching my husband rock out! We danced until we didn't recognize the music any longer. If you are ever in the Traverse City area, check out Porterhouse Productions on Facebook to see what Sam is cooking up because, I guarantee, you will NOT be disappointed! Livibility.com ranked Traverse City #4 in the top 10 Best Winter Destination Cities "Hottest Cold Cities" and after experiencing this Festival along with the amazing microbreweries from around the area, I can easily see why Livibility.com loves Traverse City! I'm from Buffalo but have been in Florida for the last 10 years and I don't think I could handle the cold. It's 40 here today and I'm numb. Sounds like you had a great time though. Good for you! That actually sounds like a lot of fun! Aside from it being outside in the cold.. I hate being! Did they have anything besides beer? Of course my husband would have been in paradise! Sounds like a great time. I have a few family members that would have loved it. They love to tour the different microbreweries in the midwest. will have to consider heading to Traverse City when this rolls in! Sounds like a great time! Now you need to come to Petoskey and we will go to the brewery! What a great time and I love festivals wish I lived closer to have attend it! Thank-you for sharing!